IS PUTIN OFFERING KUTUZOV’S GOLDEN BRIDGE TO RUSSIA’S ADVERSARIES, OR IS HE TRYING TO CROSS IT HIMSELF? The Russian tactic of giving an adversary an exit through which to escape was coined by Marshal Mikhail Kutuzov (left) during the war against Napoleon. He called it the “pont d’or” (golden bridge). The meaning was that Napoleon and his army should be allowed to retreat out of Russia, harassed, starved, diminished, but not annihilated. Kutuzov’s reasoning was strategic. It was not worth the risk and cost to the Russian army of a struggle to the death with the French. Worse, Kutuzov thought, if Napoleon were totally destroyed, there would be nothing to stop the British from emerging to threaten Russia more powerfully than the French had been capable of. Is the golden bridge still a doctrine of Russian strategy, and if so, who will express it? The question should be asked as we pass by the 200th anniversaries of the battles of Borodino (September 7, 1812), Maloyaroslavets (October 24), Viazma (November 3), and Borisov (November 21), and prepare for the anniversaries of the Russian victories in the 1813 campaign. President Vladimir Putin spoke at Borodino on September 2, conferring special awards on Maloyaroslavets for the 1812 battle and on Mozhaisk for its resistance to the Germans in 1941. There was nothing strategic in Putin’s speech except this: “only by trusting each other can we stand against the modern threats we face today.” The one tactical ploy Putin used was to call Napoleon’s multi-ethnic army French. The Germans who attacked in 1941 he called Nazis. Last week, on January 10, Putin had another chance to enunciate Russian warfighting strategy when he presided at the commissioning of the new nuclear submarine, Yury Dolgoruky, presented a campaign award to the cruiser Pyotr Velikhy, and held an open conference with the new defence minister, Sergei Shoigu, and Navy commander, Vice-Admiral Viktor Chirkov. Putin’s remarks were restricted to construction details, budget allocations, and weapons procurement. The Pyotr Velikhy is the flagship of the Northern Fleet and has been practising operations above the Arctic circle, which has been identified for a decade now as a strategic priority in defence of continental shelf energy reserves, ship movement through the Northern Route, and deterrence of poachers – of fish and everything else of value. Still, Putin had nothing to say to pinpoint Russia’s adversaries. He didn’t have anything concrete to say on the future of aircraft carriers in Russia’s forward naval strategy. There was no money for them in the 2011 naval budget, but with Defence Minister Anatoly Serdyukov out of the way on November 6, Vice-Admiral Chirkov got his carrier toe in the water, announcing that design of a new generation of vessels will be funded. “Design bureaus are tasked to develop a new aircraft carrier project. These works are well-financed”, the admiral said on November 23. Aircraft carriers and submarines are intercontinental weapons against American, NATO, and possibly Chinese adversaries. They are too costly and unnecessary for a strategy of protecting seabed oil and gas; Arctic, Baltic, or Black Sea trading lanes, or concentrating force on local warmakers around Russian borders, like Georgia or North Korea. A study of Russian naval strategy from the UK Defence Academy, published in October 2010, footnoted several statements and documents from then President Dmitry Medvedev, but almost nothing from Putin. Asked when Putin last spelled out Russia’s military strategy, Russian military experts refer to the publication of the presidential documents, Maritime Doctrine to 2020 (2001) and the 2010 Military Doctrine. But they propose doing everything, with little clue of the concrete priorities or how arguments should be decided over the money, equipment and manpower to achieve them. The spending is growing fast. In 2009 the budget outlays for national defence totalled Rb621.9 billion ($21 billion); by 2011 it was Rb1,516 billion ($52 billion), up 144% in just two years. Last year the planned growth rate was 21%, — a slowdown of sorts. But the Kremlin has decided to speed up. By the end of 2014 it will have spent Rb2,750.8 billion, a growth rate for the next two years of 25% per annum. Naturally for the domestic economy this is a powerful source of cash stimulus. For the oligarchs commanding the minerals, metals and machine sectors, this is also a guarantee of state cash for the production cost and operating profit lines on their balance-sheets, before they divert the bottom-line profit offshore. For the military services, especially the navy and the shipyards – the navy is currently taking the lion’s share of the defence budget, about 40% — this represents a transfer from the bust side of the economy to boom. Politically, this may be policy justification enough, a golden bridge to pacify domestic threats to the president, and allow potential rivals to concentrate, as Napoleon’s marshals did at the start of the withdrawal from Moscow, on getting their loot and booty safely over the western frontier. But are there foreign enemies to be deterred or defeated by such a strategy? If there’s this justification for making the “living connection to history”, how does the president read it himself? Dominic Lieven’s history, Russia Against Napoleon, was published in 2009 in the UK, and a year later in the US. It is the first history in English to use Russian documents to substantiate the victories of the first Patriotic War, and to be dedicated by a non-Russian author thus: “in memory of the regiments of the imperial Russian Army who fought, suffered and triumphed in the great war of 1812-14”. Lieven’s enthusiasm for Tsar Alexander I can be explained by his acknowledgement that the Lievens were part of the Romanov mishpocha – General Christoph von Lieven, a Semenovsky Guard, was head of the tsar’s personal military secretariat; Lieut-General Johann von Lieven commanded the 10th Infantry Division, Princess Charlotta von Lieven, Christoph’s mother, was bosom friend and chief lady-in-waiting to Alexander’s mother, Empress Marie, and governess to the tsar when he was a boy. Christoph’s wife, Dorothea, was the daughter of another of the empress’s ladies-in-waiting. But there are three strategic lessons, which Lieven credits to the tsar, Kutuzov and others in the Russian command, and which qualify for Putin’s recommendation to re-read the history and apply it to today’s battlefields. The first is logistics – by withdrawing before Napoleon’s advance, and destroying the forage and food, the Russian strategy eliminated the forage on which Napoleon’s horses, and hence his supply chain, as well as his power projection (artillery, cavalry) depended. “The horse was a crucial – perhaps even the single most decisive – factor in Russia’s defeat of Napoleon”, Lieven concludes. Napoleon lost 175,000 horses in Russia in 1812. The following year Russian intervention prevented him getting hold of new horses from studs in Poland, Prussia, and Austria. It was easier to replace the men lost to the French army than the horses. The second is intelligence. The record of the first Patriotic war reveals one of the most thorough penetrations of an enemy’s military plans, and its leaders’ most intimate conversations, in European history. 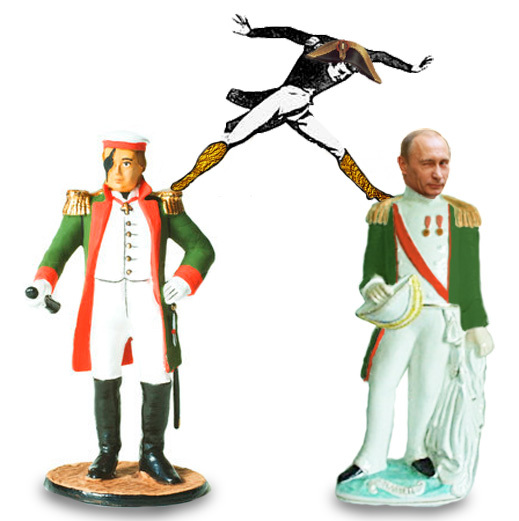 With bribes, interceptions, seduction, and other means, Russia’s command had access to every Napoleonic secret from unit strengths, arms and orders to what went into Napoleon’s mouth for breakfast, and what was happening in his sensitive stomach. The Russians were also able to mobilize considerable counter-intelligence capability, turning French and British agents into conduits of disinformation. In intelligence gathering and its application to tactics and strategy, the Russians clearly outclassed the British. The third lesson is the golden bridge. Requiring confidence in their ability to anticipate the enemy, and a realistic appraisal of their own weaknesses and vulnerabilities, the Russian command was able to prevent Napoleon from fighting the Russian campaign as he wanted. The bridge strategy gave the enemy the one predictable exit that optimized on the domestic and foreign political calculations in Alexander’s strategy. To achieve it, Kutuzov had to withstand constant criticism of his competence, age and loyalty from younger officers with attack plans Napoleon expected them to deploy. Borodino was the one exceptional sacrifice Kutuzov was obliged to make, allowing Napoleon to deploy 587 guns against almost 100,000 Russian troops on flat ground of less than one square kilometre with minimal cover. Although Kutuzov had 624 guns on the field, they were deployed in a scatter, unable to concentrate their fire on the French, and sitting ducks for the French artillery. In meat-grinders like that, the Russian heroism was in the sacrifice of lives without victory. In the golden bridge, the heroism was in the saving of lives, and victory at the same time. Russian military experts acknowledge there is a vivid contrast between the level of detail and purpose Putin opens to public discussion of economic and social policies, and the vagueness of his military statements. Is this a case of the traditional suspicion of a plainclothes intelligence and security officer for the uniformed services? An incumbent politician’s apprehension of the political appeal of the army since 1996, when General Alexander Lebed defeated Yeltsin in the first round of the presidential election? Or the commander-in-chief’s fear of backlash from Navy mistakes since the Kursk submarine catastrophe in August 2000, seven months into Putin’s first term? Was the Navy hinting that clear orders weren’t coming down the line? From the pro-American perspective, Felgenhauer claims the hesitancy, ambiguity and contradictoriness have a simple root: “Putin and Russian admirals have ambitions to recreate a blue-water navy, but do not have the capability”. From the Kremlin perspective, it’s convenient if that’s what foreign adversaries continue to think, and it would be contrary to policy if Putin set them straight. It goes without saying there is no family which holds Putin in thrall and can pressure him into making strategic mistakes.